The sun came out today so rushed outside (once the grass was dry) to take some photos of a few more of my quilts. Unfortunately it was also windy so no sooner had I laid it all out, turned around to climb on my steps to take the photo, than the wind had flipped it over - Grrrrr!!! (much to the amusement of 2 of my sons who were sitting eating their lunch - they could have offered to help but I guess it was funnier watching Mum up and down the steps!!! This is the first quilt that I ever won a ribbon for. It is called 'Dresden Hearts' and I made it in 2008. It won 1st prize for longarm quilting and it won the Visitors Choice ribbon too. It was lovely winning the longarm prize but I think I value the visitors choice ribbon more as it is lovely to be judged by your peers and recognised. Everyone who visited the show had a vote and at the end of the show the winner was announced so I didn't know about it until I turned up for prize giving on the last day. I made it with a lot of my 'repro 30's' fabrics. I love them, they are so cheerful. I still have enough in my stash to make at least another 4 or 5 more quilts!! I did a peacock meander in all the plain white (labour of love!!) and continuous curve in all the squares. 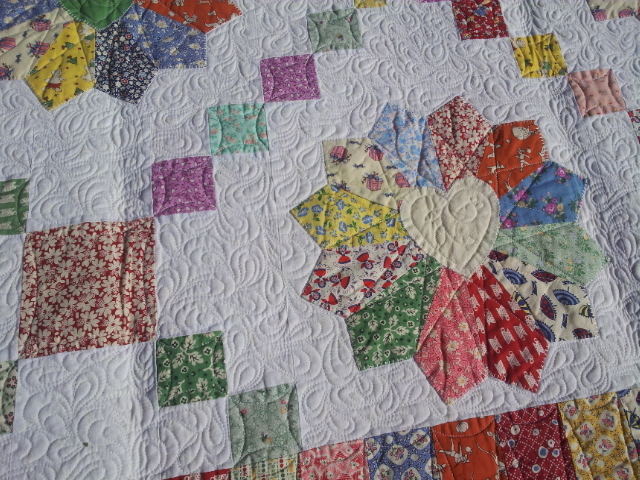 I stitched straight lines point to point in the plates and a heart motif in the centres. This is one quilt I am going to keep. It has been washed umpteen times and is lovely and soft now. Came inside to take some photos out of the wind and this is what you get if you try to take a photo on the floor of the lounge!!! I'm so glad Coco wiped his paws first!! 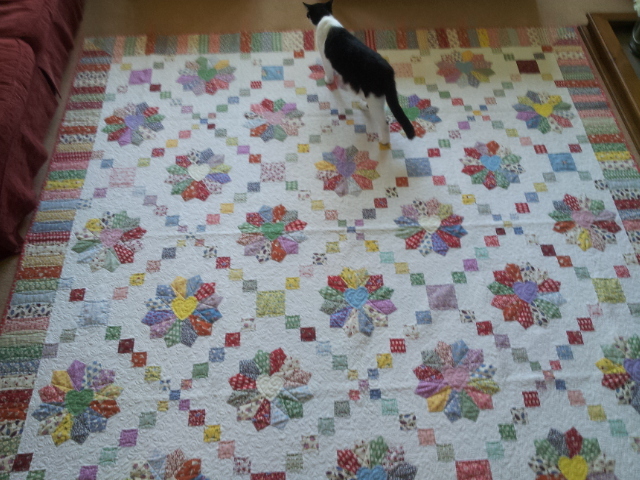 This is another quilt I made using 1930's fabrics. I had bought a ruler for doing curves and wanted to do a curved edge on a quilt so made this little quilt to have a go. I was pleased with it once it was done. It is a lap size quilt and I just quilted it with an allover meander patter. Just to prove I don't only make 1930's quilts (!) here is one I made using some plaids and some Kaffe Fassett fabrics. I would really struggle to make a quilt with 4 fabrics - I would much rather make one with 84!!! This was an exercise in 'anything goes' and I just had 2 piles of fabric, one plaid and one print. I didn't try to match fabrics and each block has a negative and a positive. 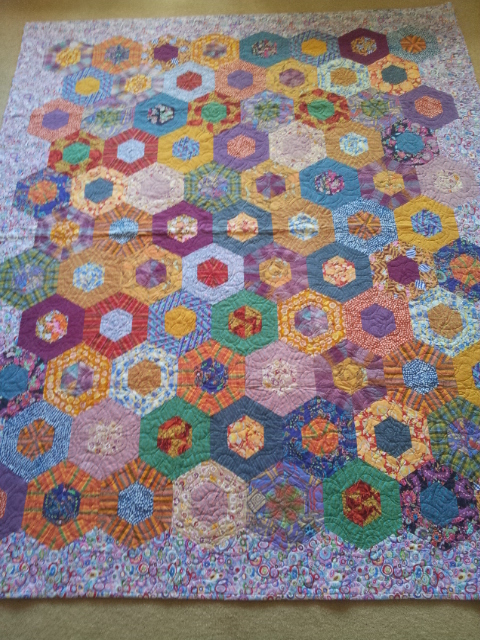 This is the sort of quilt I want to make when our weather turns grey and dull and the colour comes from inside. 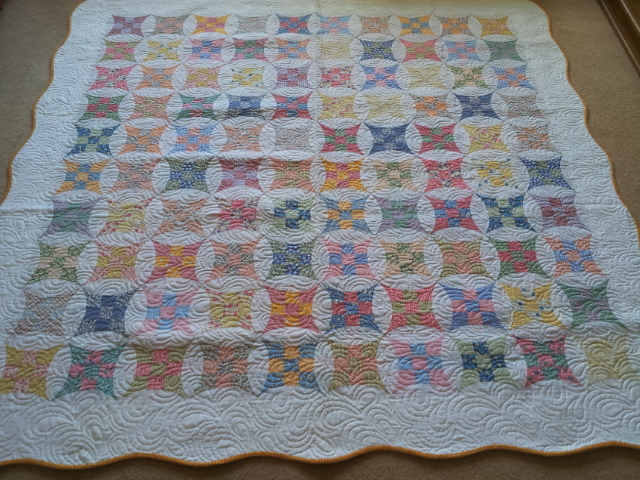 I quilted this with an allover pattern called 'swirl and twirl'. And finally, another quilt using my 'more is better' method of fabric selection! Not sure what this block is called but it appealed to me so used up some more scraps. 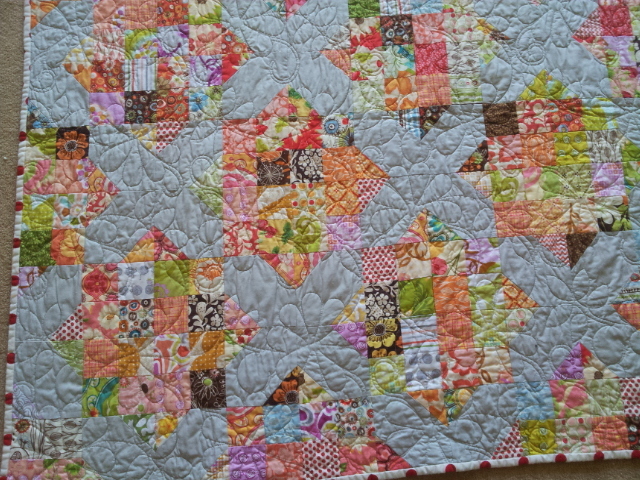 I would never say that I was a fan of orange fabrics but once I had put all the blocks together, it was an 'orange' quilt (the plain grey does temper it somewhat). I do like it though. 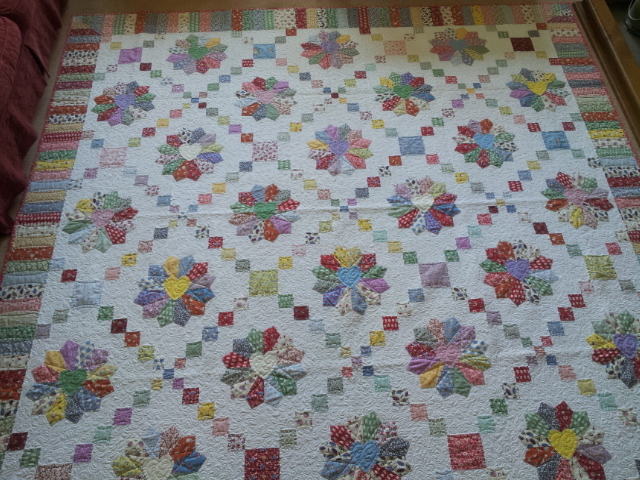 I quilted it with a pattern called 'retro daisies'. Another quilt that has been washed many times, hence it's wrinkled appearance. Hope you enjoyed looking at a few more of my quilts. Apologies about the creases in them but they are stacked up folded in piles in my studio. I would love a spare room with a double bed where I could lay them all out flat but until the sons leave home, no can do! Acabo de ligar o tal viciante computador e vem a surpresa mais linda do dia,estou encantada com suas colchas,que trabalho lindo e bem feito,parabéns.Esta primeira de placas é encantadora,nem passou pala minha cabeça fazer uma desse seu jeito,inovadora é para mim a palavra.Deus te abençoe,beijos. Nice to see these quilts again Chris. Those quilts are absolutely beautiful! 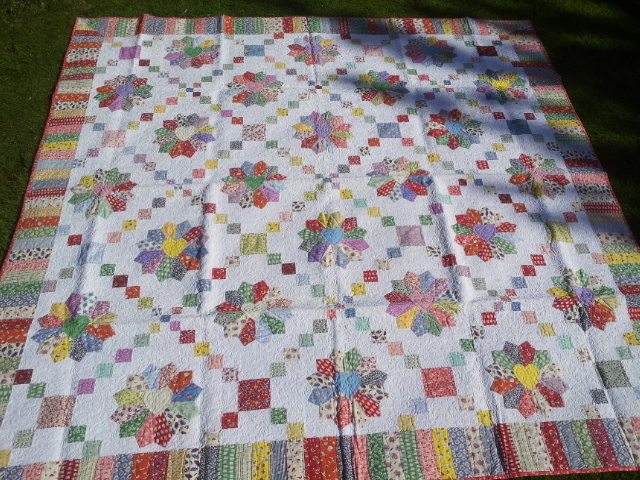 I especially love the look of the peacock meander quilting. Thanks for the inspiration! 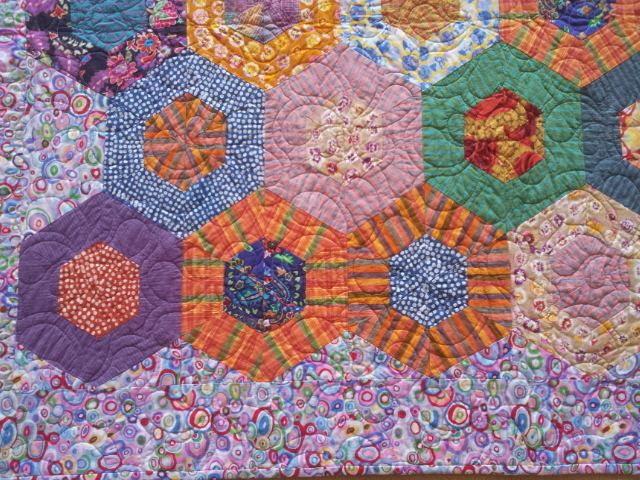 I adore the second quilt - must add that block to the long list of things to try! So wonderful seeing your quilts - these are all so cheery. 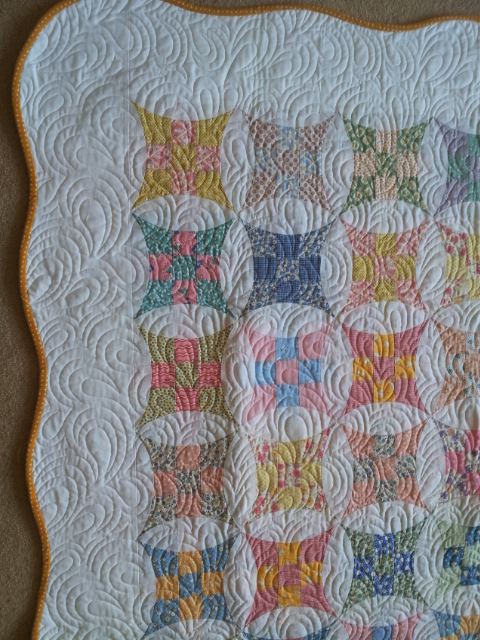 I think I have one or 2 fq's of 1930's, but that may need to change when one sees how cheery your quilts are! Need some cheer with all this rain *sigh*! Arkansas Crossroads! 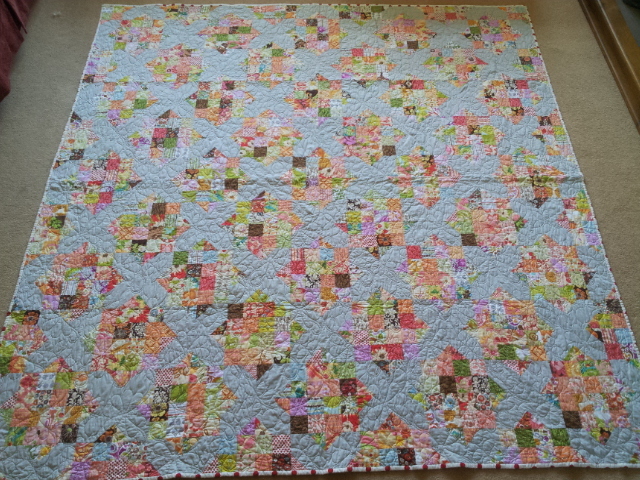 I absolutely adore this pattern i have made about 3 :-) Gorgeous quilts, as ever.